We picked up Bono as a pup on Jan 2008 from a private breeder in Sydney. He was the last pup unsold from a litter of 7. At first glance, he didn't seem as lively or active as his brothers or sisters. Rather the total opposite. Bono seemed more like Snoopy, lazy and sleepy-looking. However, his cute and innocent looks won us over and he was quickly snapped up at an instant. Little did we know that this was going to quickly change... Driving home, with Bono sleeping all the way, we thought of naming him Snoopy. But this name didn't seem to match this breed. So we finally came up with "Bono", inspired by the lead singer of Irish band U2. Bono has been a bundle of fun and joy! There hasn't been a dull moment, just more surprises! He is truly a people's dog and we have cherished him since the day he arrived in our home. 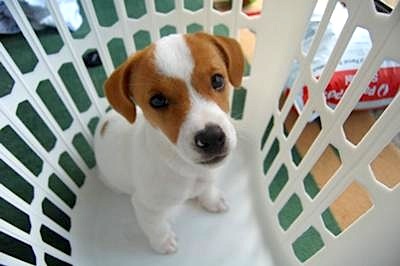 For all those would-be dog owners, it's hard to not consider a Jack Russell Terrier. He is so beyond cute!!!!!! Good luck with your little child. (Mine feels like a child to me, does Bono make you feel that way as well?) Anyway, he's extremely cute, and is something to be proud of. He is toooo cute, and the name fits him, looking wise, lol.